Thilanga says SLFP to quit Govt. Speaker Karu Jayasuriya launched last-ditch effort to save the beleaguered ruling national unity coalition yesterday, the SLFP continued to play hardball by threatening to quit the alliance as a crippling political crisis precipitated by stinging defeat for both main parties in the government entered its eighth day. After a relatively quiet weekend, Speaker Jayasuriya accompanied Prime Minister Ranil Wickremesinghe to President Maithri-pala Sirisena’s official residence at Paget Road last evening for last ditch talks to resolve the crisis and restore stability following the week of political chaos and turmoil. Following discussions that aides said lasted just over an hour, the President and the Prime Minister had reached consensus on a major cabinet reshuffle on Wednesday (21), Daily FT learns. The present status quo, of a national unity government with Premier Wickremesinghe at the helm, was likely to continue, following the Speaker’s intervention at this crucial juncture, highly placed sources told Daily FT. However soon after President Sirisena met with the Speaker and the Premier, he also met with UPFA ministers. Soon after the meeting Deputy Minister Thilanga Sumathipala reportedly told the media that the SLFP has decided to quit the national unity government. The President would seek the Supreme Court opinion on dissolution of the National government, Sumathipala said. A decision of the SLFP will make its decision known today, other reports said. Daily FT learns that during his meeting Speaker Jayasuriya told both leaders that they had to stick by each other and work together in order to deliver on the promises made to the people on 8 January 2015. Big changes could be made in light of the recent verdict of the electorate at the local government elections, Jayasuriya had conceded, while a change in the Prime Minister would precipitate further crisis at this juncture, he had warned. The Speaker told President Sirisena and Premier Wickremesinghe that once radical changes in the Government that would restore the people’s confidence had been made, both leaders must resolve to make a fresh start, it is learnt. Among these ‘radical’ changes would be a major reshuffle of cabinet portfolios, probably by midweek, authoritative sources told Daily FT. The ministries of Law and Order, Highways, Foreign Affairs, Justice and several others are likely to see changes, the sources added. Minister of Law and Order Sagala Ratnayaka, who is also the Prime Minister’s chief of staff, has already agreed to give up the portfolio in the reshuffle. 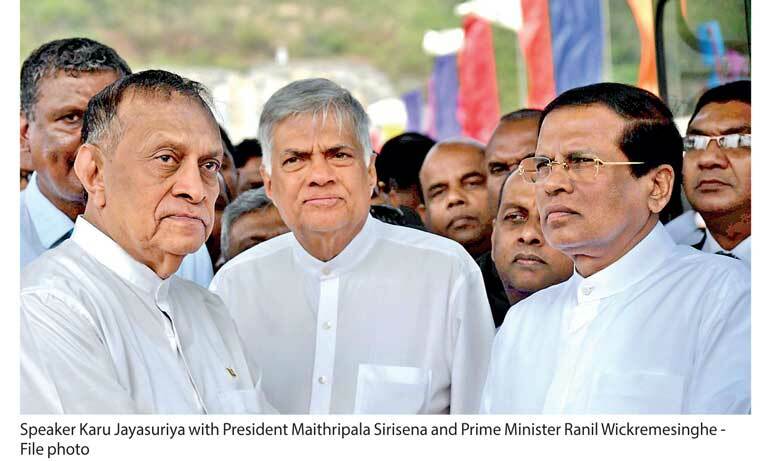 Now that the Speaker has managed to achieve some compromise, it would be up to President Sirisena to persuade his party to back the changes and continue to work within the coalition, a senior UNP member told Daily FT on grounds of confidentiality. It remains unclear if the SLFP will agree to the proposals discussed and stay in the Government, sources said. The political situation remains uncertain since developments occur every hour, the sources added. The crucial talks between the first, second and third citizens of the country was a sign that the crisis in the Government ran very deep, political observers noted. The talks came as sources close to the President claimed he was mulling a suspension of Parliament sittings until the crisis in the Government was resolved satisfactorily. However, after the high-level discussions last night, the decision has been shelved for the moment, Daily FT learns. The Speaker's decision to mediate to bring about resolution to the crisis has been hailed by senior UNPers, including the leadership, UNP sources said. Jayasuriya, whose name has repeatedly been suggested as a replacement after the SLFP refused to work with the current Prime Minister, would have played a vital role to end the deadlock that has affected investor confidence, the stability of the rupee and the stock market over this past tumultuous week.